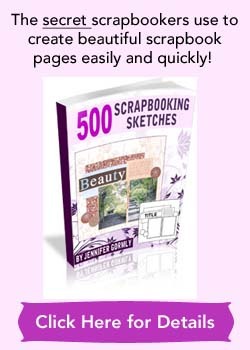 Scrapbooking ideas, tips, tutorials, and product reviews for beginners. 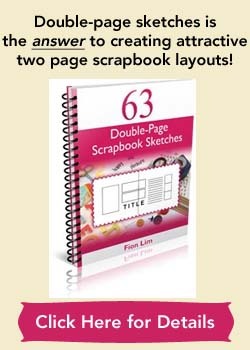 This scrapbooking idea should be a fun one. It’s to pay tribute to the stuff you can’t live without! Basic necessities for survival aside, family and friends you must love aside, spend a few minutes on little pleasures you can’t forgo, gadgets that make your life easier and more convenient, stuff that add value to your everyday life. This is not an “all or nothing” list. It’s likely to reflect your present frame of mind. What you feel you can’t live without for the moment. Things will change, priorities will shift. But 10 years down, you’ll see what left their imprints on your life 10 years ago. For example, the weather has been hot (ok, it’s always hot in Singapore but recently it’s been very hot) and so suddenly I can’t live without the medicated ointment Zam-Buk to soothe the itch of mosquito bites. I’ve been on a bubble-tea craze for awhile, alright I mean over a year now. But it might go away someday. Hopefully. Enjoy and have fun with this week’s idea! Supplies used: Cardstocks – Bazzill Basics and The Paper Company; Patterned papers – Basic Grey LilyKate “Cherry Blossom”, Brenda Pinnick Designs “Paper Confections”; Clear stamp – Journaling by Katie Pertiet; Fabric flowers – Daiso Japan; Epoxy flower stickers – Vivid Stickers; Flower ribbon – from stash; Black marker – Zig Memory System “Dotta-Riffic”; Black pen – Zig Memory System “Millennium”; Brown ink – StazOn “Timber Brown”; Scallop-edged scissors – Daiso Japan. 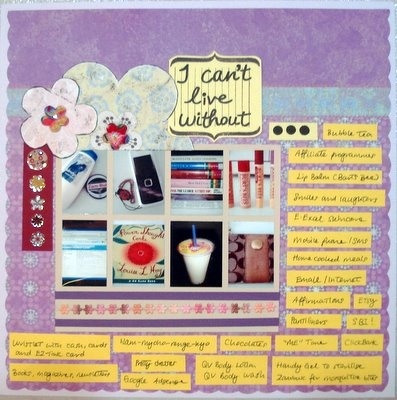 Copyright © 2019 Everything-About-Scrapbooking.com. All Rights Reserved. The Magazine Basic Theme by bavotasan.com.